Enjoy this guest post from Rolf of Tradeciety! Tradeciety is a trading blog created from traders, for traders. Rolf and his team challenge common trading wisdom, debunk trading myths and offer a unique and different view on trading and the financial markets. You can read more from Rolf at Tradeciety.com or stay up to date by following his Twitter account @Tradeciety. Please feel free to contact me if you would like to guest post on MMYW. Traders believe that they just have to find the one trading strategy that will finally make them all the money they desire. However, after years of trading and frustration, most traders will recognize that the hunt for the Holy Grail is not going to yield the reward they have been looking for. That’s when they start looking for answers elsewhere. In the following article, we explore one of the most underrated and misunderstood concepts in trading. If you understand how to use the reward to risk ratio correctly, you will know why even a trader who loses most of his trades, can easily come out ahead. What is the Reward to Risk Ratio? Let’s assume you buy a stock at $110 with a stop loss at $105 and your take profit at $120. Applying the formula above, you get a reward to risk ratio of 2. You are right, this is nothing to get excited about, but what will come next will be an eye-opener. The things that the reward to risk ratio tells you will be very helpful and enable you to make trading decisions on a whole new level. Here comes why the reward risk ratio should be among your mot favorite trading concepts. The reward to risk ratio tells you immediately whether or not you should take a trade and you can make money over the long term. A reward to risk ratio of 2, as seen above, means that your winning trades will be twice as big as your losing trades. Therefore, for every three trades you only need one winning trade in order to at least break-even; which translates into a required winrate of 33%. 2. Don’t try to manipulate the reward to risk ratio of a trade in order to match your winrate. 3. To take this concept to the next level, track the winrate statistics for individual setups and instruments. 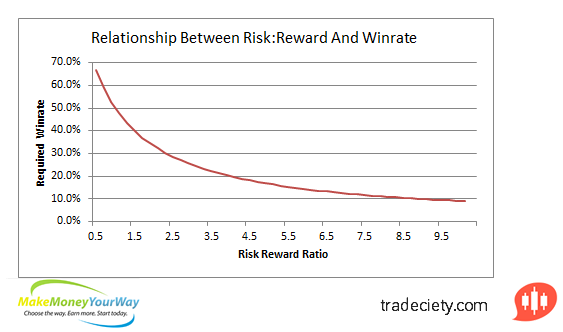 The graphic below illustrates how the reward to risk ratio and the winrate interact. The higher your reward to risk ratio, the lower you winrate can be. How often have you heard someone telling you that trading with a 50% winrate is gambling or that you should avoid trades with a reward to risk ratio of less than2? Yes, we all know these people and they could not be further from the truth. To be a professional and profitable trader, you don’t need a high winrate. You don’t even need a winrate of 50%. Not even close. You can lose the vast majority of your trades and still make money. It all comes down to the right combination of reward to risk ratio and winrate. I can already hear the other tribe of traders protesting about what we have just written, but, in contrast to other trading concepts, the use and the application of the reward to risk ratio is not subjective or debatable; it’s a verified, mathematical concept that is already influencing your trading performance, whether you agree with it or not. Research proved that far more than 95% of all traders lose money consistently. The vast majority of all traders is following the same path, looking for better and fancier indicators, trying system after system and wondering why they, even after years, still lose money consistently. We strongly encourage you to take a look outside the box and follow the suggestions of professional traders who know that trading successfully is not about finding better entries, but about creating an edge by using proven concepts. My current trading approach is different. I mostly sell options, call and/or put options, which are far out of the money, preferably with high implied volatility and against the trend. These offer a very significant statistical edge, and can have a very high winrate of about 80-90%. On the contrary, on each individual trade my risk is bigger than my reward, sometimes 3 to 1. 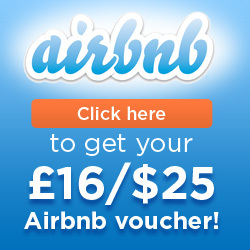 So far, this is working for me, with a nice profit just about every month. I agree in that this concept makes perfect sense from a theoretical point of view. However, you didn’t take into account the order costs especially when spreading your money onto a vast number of trades. For someone who sets out 10 orders à $500 it might mean to lose $100 when buying and $100 when selling in case a trade costs $10. $200 are already 4% of the whole invest. Of course, 10 orders à $5000 will give totally different picture.